Mukund Rathi offers a viewpoint on the discussion of net neutrality. THANK YOU to Ryan de Laureal for his great article "Taking a toll on the information superhighway" about the FCC's planned repeal of net neutrality. I want to briefly expand on the following sentence: "Large sectors of tech capital, primarily internet-based companies like Facebook, Google and Netflix, also support [net neutrality], since their businesses benefit from unfettered customer access to their platforms and data." Google's slogans are typical. The internet is "a level playing field, where new entrants and established players can reach users on an equal footing," according to an appeal at Google Take Action, which concludes that "once you're online, you decide what to do and where to go." Evidence of the hypocrisy of these slogans is easy to come by. For example, the internet companies have been building internet "fast lanes" for themselves, in cooperation with the dreaded internet service providers (ISPs), for years. Two common types of fast lanes are peering connections and content delivery networks, which use the ISPs' sections of the internet architecture to deliver information more quickly and reliably. 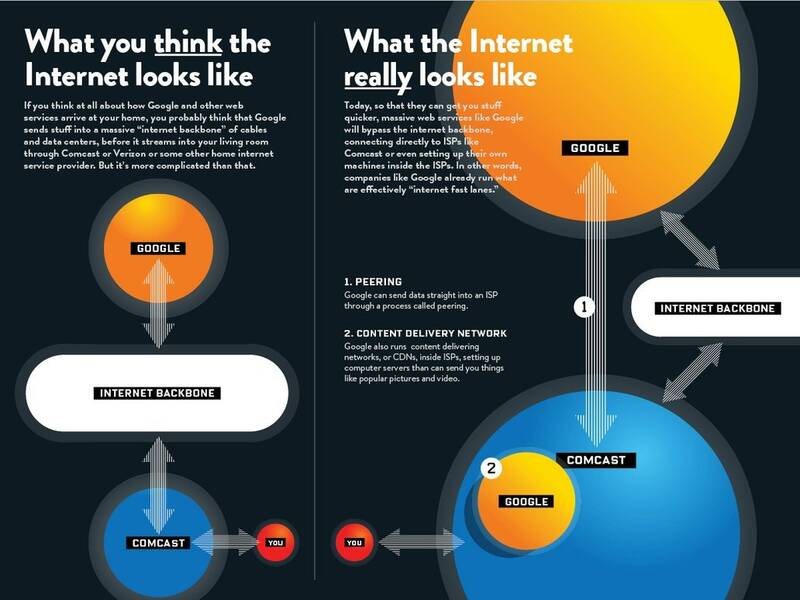 This graphic by Wired helps illustrate how the internet is certainly not a "level playing field." It's also false that "unfettered customer access" exists on the internet, or even that internet companies desire this. On the contrary, unfettered access would destroy their business models. Facebook's platform, for example, includes a carefully curated News Feed which structures whose posts are shown, in which order and to which people. This is particularly important for advertisers, who pay Facebook to curate discriminatory News Feeds that more effectively deliver ads. If customer access was unfettered and Facebook couldn't unilaterally structure who sees what, advertisers would stop paying and the business would fail. The same goes for any social media companies that rely on advertising money, which is...basically all of them. Unfettered access would also pose political problems for internet companies who need to toe the line of bourgeois politics. So while Twitter refuses to penalize Donald Trump for his repeated tweets calling for discrimination and violence against Muslims, it has taken down hundreds of thousands of accounts for allegedly promoting terrorism. YouTube, as documented by The New York Times, has removed tens of thousands of videos this year of Anwar al-Awlaki, an American citizen who the Obama administration killed with a drone strike for alleged terrorist activities (two weeks later, the U.S. also killed his teenage son Abdulrahman al-Awlaki). And, of course, there's also the massive online censorship in response to demands by political elites and their McCarthyist, anti-Russia paranoia. There's a lot to be said about the way different sections of capital are structuring the internet. Sometimes, as with the specific reforms of net neutrality, they are at odds. Other times, as with other aspects of unfair architecture and Islamophobic censorship, they are in cooperation. This also suggests that the demand for net neutrality, while positive, is limited, because the internet as it exists is fundamentally not neutral. So we should widen our political critique beyond the dreaded ISPs and develop a more comprehensive theory of the internet and its architecture. Lost amid the many horrors of the Trump era was last month’s gift from the administration to the Internet monopolies. The actions of the FCC are about to give a few powerful companies unprecedented control over our access to online content. A new report details the multiple ways that the Obama administration has attacked whistle-blowers and press freedom.